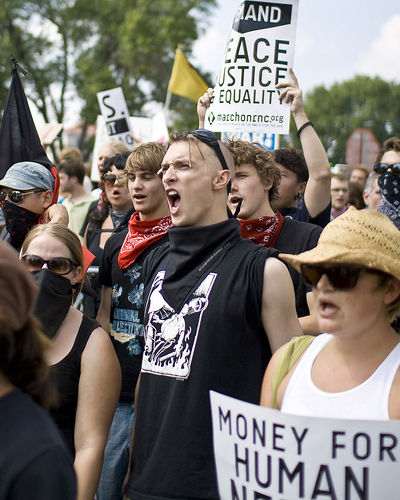 Protest march against Republican National Convention in St. Paul in 2008. Photo by Hans Kuder. It’s not only voices on the religious right who claim we’re in the end times. There’s no doubt that major changes are needed in order to confront a range of deepening ecological and political crises. One response to this is despair—always a seductive option when we feel powerless. Another is to join some stampede into hasty action that doesn’t actually make a difference, although it may feel better than cynical withdrawal. The good news, for now, is that the Occupy movement’s general assemblies have a process of decision making that is highly democratic and minimizes the chance of hasty actions that accomplish nothing—or worse. And, so far, the collective spirit of the assemblies has been sufficient to stave off despair. But as the movement prepares for the coming spring, there’s a real danger that its mood, and its patience, might change for the worse. Same-old, same-old. Don’t let the freshness of the Occupy movement fall into familiar patterns. Why put the new wine of Occupy into the old wineskins of predictably boring contests with city police? The media will cover it with its well-worn template from the past, and the new politics of Occupy will risk being forgotten. One reason Gandhi was able to force Britain to give up control of India was his number-one strategic principle: It’s always better to stay on the offensive. Rather than simply being reactive, a movement should choose its own space for struggle. Going to the sites where the powerholders meet is not only reactive, but it emphasizes their power, as compared with the movement’s. The workers who recently occupied a plant owned by Bank of America in Chicago, for instance, forced the bank to deal with them on their terms. Based on the history of mass bashes in the U.S., activists tend not to find them conducive to learning how to win concrete, lasting victories. Fortunately, there is an alternative strategy that does support rapid learning: campaigns. Choosing a campaign with clear objectives, a clear target and clarity about how to expand enables activists to evaluate their progress—in other words, to accelerate their learning curve. It also puts them in charge of who they want to reach out to; if a local Occupy is 95 percent white in a city that is half people of color, they can do something about that through a campaign relevant to local issues. Campaigns encourage us to ground our tactical choices in the context of real outcomes down the road, given increased knowledge of the opponent and of potential allies. You’ll see the difference between a movement that simply plans one action after another with diminishing turnout from “the usual suspects,” and a movement that plans actions that build capacity so that the later actions are broader and stronger than the earlier ones. Winning part or all of one’s objectives in a campaign is empowering; it becomes a built-in deterrent to despair. Coming back from Chicago with stories about police repression might stoke our anger, but who lacks anger? What’s missing in Occupy is not anger; it’s empowerment. In this way, campaigns encourage sustainable activism. The loss from burnout is costly; too many movements look like a revolving door, with consequent loss of skills, knowledge, memory, trusted networks and resources. I would love to see today’s young people for whom Occupy is their first serious encounter with activism still active in 20 years. A campaign supports sustainability; it calls for focused energy over a period of time—a year, perhaps, or three—and after the campaign is done the tired activists can recover, fix their teeth, go back to school or whatever. When ready, they can bring all that experience, plus reflection, to their next one. There are already many fine campaigns underway in the Occupy movement and others ready to go which would undermine the 1 percent on too many fronts for them to retain their present degree of dominance. We can do direct action, grow, combine with allies, learn from our mistakes and successes, become strategists, and accelerate our learning. That’s what the planet, and its victims of economic injustice, need most. Another reason Gandhi was successful is he understood economics and successfully conveyed that understanding to others. His movement, swadeshi, was about voting with your wallet. He got the common Indian person to stop giving their money to the British invaders and taught them to operate an economy that does not depend on the British by teaching them to make what they need. They could trade among themselves. Without the steady cashflow from India to Britain, Britain cracked. How do you do the same to the current economic climate? Well, the move from banks to credit unions is good, but it’s only a start. Support your small local businesses. Stop giving all your hard-earned dollars to Walmart so Sam Walton can screw you over by handing it on to politicians who will make laws to screw you over. Another good article by George Lakey on the importance of being strategic and sustained campaigns rather than large one time actions.